This is a colorful addition to your Doggy Day Care room or it makes a great run for your FUNgility course! 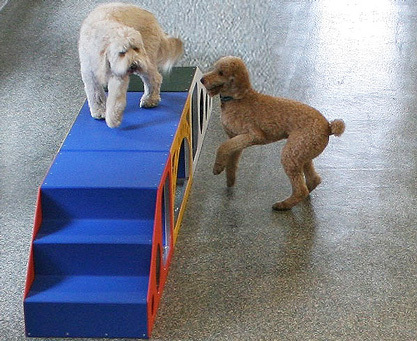 Each end adds a different obstacle for dogs going over to tackle. Assembled from 3 FUNiture pieces, it can be built with up to 6 colors (2 colors for each piece). The standard assembly is a FUNiture Ramp, Bridge and Stair. Footprint is 24" x 144"
Dogs can run up and over or through. For more fun, add additional bridges. This FUNgility combination will certainly exceed your expectations. The frames are made from 1.25" heavy-wall aluminum tubing with rounded edges so that it is easier and safer to move around or carry. The plastic surface is a commercial grade 1/4" HDPE plastic which is texturized to reduce slipping. With the aluminum frame and plastic surfacing, it is resistant to weather. These high quality pieces are built to last! Watch as Karah easily trains a dog to walk over this piece. Training on fungility equipment is great way to exercise and bond with your pet. Prices are subject to changes. Please call to place an order, for price confirmation or with any questions. The lightweight, welded frame is constructed from 1.25-inch square aluminum tubing with rounded corners for exceptional strength and easy handling. The surface is constructed from commercial grade 1/4" HDPE Plastic with a high performance, non-slip pawsitraction design for inside and outside doggy day care use. Doggy Day Care FUNiture is available in 10 colors!